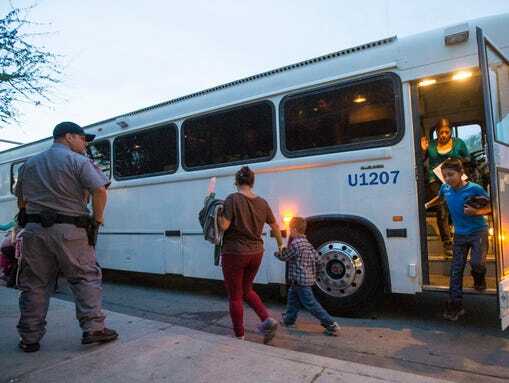 THE OBAMA POLICY-DROP OFF ILLEGALS AT BUS STATION! “This is a huge concern,” said Ira Mehlman, a spokesman for the Federation for American Immigration Reform, a Washington, D.C.-based group that advocates for more immigration and border enforcement. “This is exactly the incentive for people to cross the border illegally,” he said. “It’s not safe healthwise and we are concerned for their physical safety,” said Cyndi Whitmore, a volunteer with the Phoenix Restoration Project, an advocacy group that has been going to the bus terminal in Phoenix to help. “The conditions under which they are released are inadequate and inhumane,” she said. But Mehlman at FAIR said that once migrants are released, they often disappear and ICE doesn’t go looking for them unless they have criminal records.